hd00:18Little girl jumping while playing Hopscotch at park. Cute girls on children playground outdoors. Legs of kids jumps hopscotch on asphalt. hd00:20GRIZE, SLOVENIA - 10. JUNE 2017 Boys are playing soccer on the sports court. It's a nice and warm summer day and they enjoying spending time outdoors. hd00:21Young Asian boy running on blue track, fall and help by another boy. 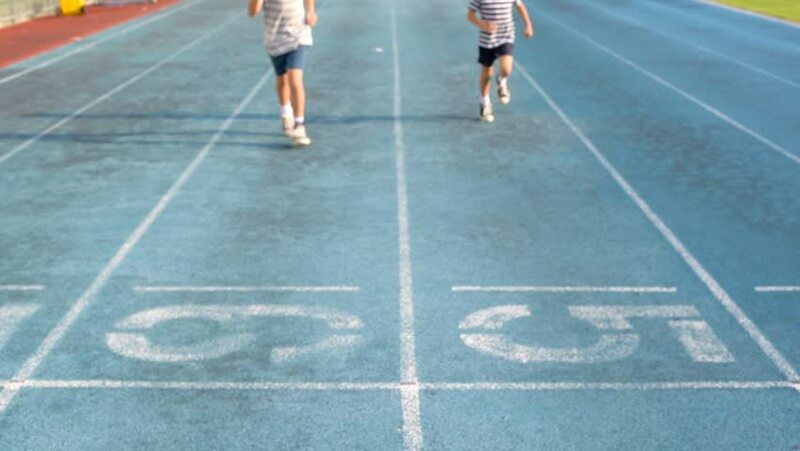 hd00:19Slow motion selective focus at two young Asian boy running on blue track to the finished line. hd00:09Slow motion selective focus at two young Asian boy running on blue track to the finished line. hd00:11Slow motion selective focus at plant, Young Thai boy spray water to little seedling on the black soil in the garden. Earth day concept. hd00:22Selective focus at vintage alarm clock show at six o clock and out focus young asian boy sleeping and wake up to play smart phone on bed.